Podhorzer and Schechter Lead Projected AL Standings! And the season doesn't start until Sunday! | TOUT WARS! Podhorzer and Schechter Lead Projected AL Standings! And the season doesn’t start until Sunday! 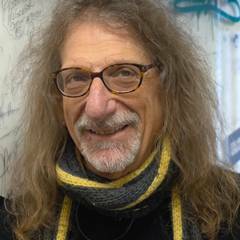 Using Clay Davenport’s projections applied to the Tout AL rosters, Mike Podhorzer is going to win Tout AL big this year, finishing 10 ahead of Larry Schechter and nearly 20 ahead of Rob Leibowitz. Here’re the projected results, thanks to onRoto.com‘s Toy Box. 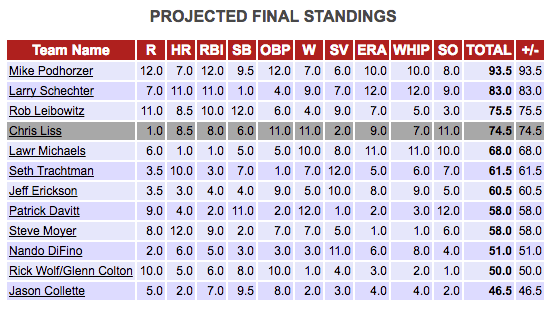 But onRoto doesn’t project the standings based on rest of year projections using only one projection system. They also run them with the BaseballHQ rest of season projections. With BaseballHQ, Podhorzer and Schechter are closer, much closer, but there is also an alsoran, Patrick Davitt, who becomes a contender in a seriously tight race. Guess we better let them play it out. 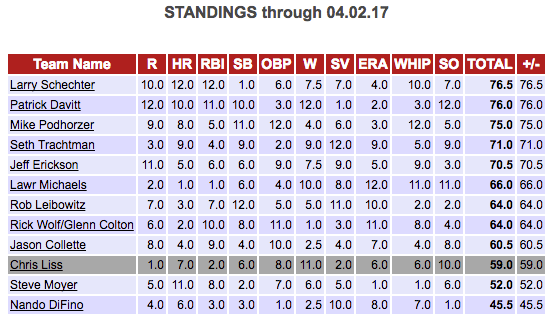 Previous Previous post: Mike Gianella Wins Tout Wars NL for the Second Time in Three Years!